We consider the problem of the reachability of states that are elements of a topological space under constraints of asymptotic nature on the choice of an argument of a given objective mapping. We study constructions that have the sense of extensions of the original space and are implemented with the use of methods that are natural for applied mathematics but employ elements of extensions used in general topology. The study is oriented towards the application in the problem on the construction and investigation of properties of reachability sets for control systems. Constructions involving an approximate observation of constraints in control problems, as well as various generalized regimes, were widely used by N.N. Krasovskii and his students. In particular, this approach was applied in the proof of N.N. Krasovskii and A.I. Subbotin’s fundamental theorem of the alternative, which made it possible to establish the existence of a saddle point in a nonlinear differential game. In the investigation of impulse control problems, Krasovskii used techniques from the theory of generalized functions, which formed the basis for many studies in this direction. A number of A.B. Kurzhanski’s papers are devoted to the solution of control problems related in one way or another to the construction of reachability sets. 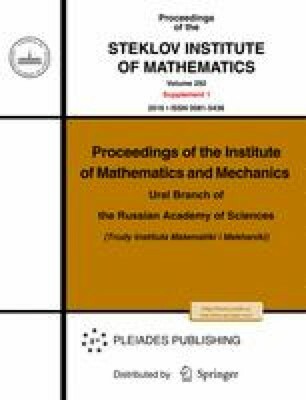 Control problems with incomplete information, duality issues for control and observation problems, and team control problems constitute a far from exhaustive list of research areas where Kurzhanskii obtained profound results. These studies are characterized by the use of a wide range of tools and methods from applied mathematics and various constructions as well as by the combination of theoretical investigations and procedures related to the possibility of computer modeling. The research direction developed in the present paper mainly concerns the problem of constraint observation (including “asymptotic” constraints) and involves other issues. Nevertheless, the idea of constructing generalized elements of various nature (in particular, generalized controls) seems to be useful for the purpose of asymptotic analysis of control problems that do not possess stability as well as problems on the comparison of different tendencies in the choice of control in the form of dependences on a complex of factors inherent in the original real-life problem. The use of such tools as the Stone–Čech compactification and Wallman’s extension is, of course, oriented toward the study of qualitative issues. In the authors’ opinion, the combined application of the approaches to the construction of extensions used in control theory and in general topology holds promise from the point of view of both pure and applied mathematics. Apparently, the present paper can be considered as a certain step in this direction. Original Russian Text © A.G. Chentsov, E.G. Pytkeev, 2014, published in Trudy Instituta Matematiki i Mekhaniki UrO RAN, 2014, Vol. 20, No. 4.